Olympic All Access Pass Show Indie-Catur February 13th: Join Us! In conjunction with the “Fall in Love Indie-Catur” event on February 13th, 11 Alive will bring an Olympic All Access Pass show to Decatur Square from 5 – 6 pm. They will be honoring the Winter Olympics in Sochi and broadcasting live from Decatur! Join us for this fun event. Wear your Team Decatur or other Decatur apparel and be part of the fun. 11 Alive would like folks to arrive at 4:15pm on the MARTA Plaza. We will be bringing our Team Decatur banner and encourage the community to bring signs promoting Decatur and active living or sports in the city. Click here to see the show they brought to the city of Dallas for the Summer Olympics. After the broadcast, stick around for ” Fall in Love Indie-Catur”. Join the Valentine fun Indie-Catur this year with a special Terrific Thursday event. Have your photo made with the Valentine statue at a special photo booth. The sidewalks will come alive with performers – musicians, dancers and more, and the shops will be open for last-minute shopping for your favorite Valentine. Watch TheDecaturMinute.com blog for more details. See you on the Square!! 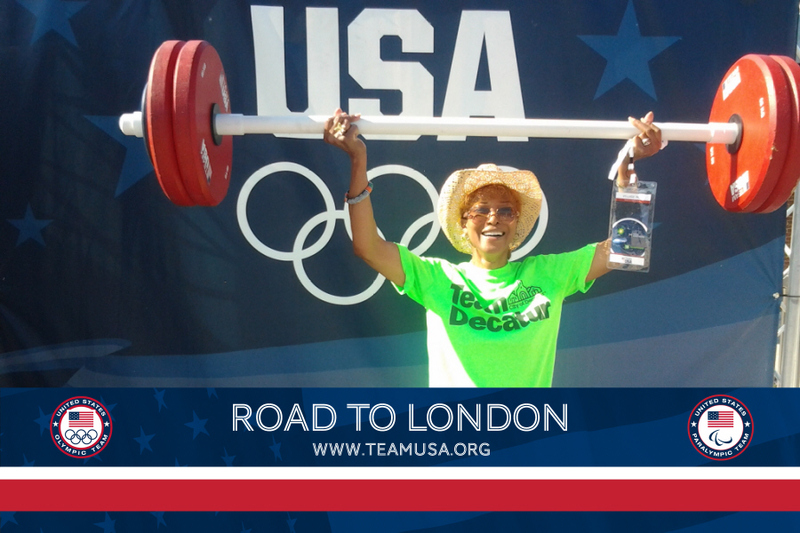 Photo of Pamela Pryor showing her strength at a Summer Olympic Event in Decatur.